Let our Puppy Professionals care for your pup while you are away. With visits approximately 4-hours apart, your pup will benefit from a consistent routine. 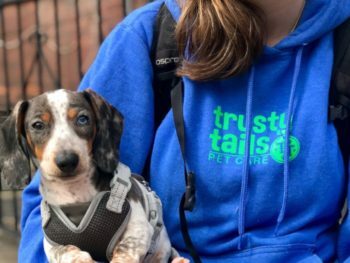 At Trusty Tails Pet Care, we are all about making your life easier and your puppy’s life happier. We believe in Puppy Happiness. Let our Puppy Professionals visit your pup and give you peace of mind. Let us care for your pup while you are away. Is Our Puppy Program Right For You? Do you work during the day and need a reliable pet care professional to come in and check on your puppy while you are not home? Do you feel overwhelmed by the whole notion of having a puppy and need someone with tons of puppy experience to help guide you in the right direction? Do you need help with routine relief breaks to ensure your puppy stays on a proper schedule for house training? Do you feel guilty leaving your puppy in a crate all day? Want him to have some human interaction to break up their day? Or maybe even a furry friend or two for a walk when they’re old enough? Because we believe in Puppy Happiness, we have a team of puppy professionals ready to care for your new puppy’s every need. All of our dog walkers go through an extensive screening process that includes a background check and comprehensive training program to ensure we provide the best care possible. With our Dog Happiness Team, you can rest assured you will always have a backup walker in case of emergency. Your dog is never left without their scheduled care. Schedule a Quick Phone Consultation Get Started with Puppy Care & Register Now! Housebreaking — We will help maintain a proper housebreaking routine with a consistent and reliable schedule. Companionship — Provide your puppy with companionship when you can’t be there—Lots of Love and Affection! Socialization — Once your puppy has all the necessary shots, we will introduce him/her to a few play buddies during the day. Feeding — We will feed your puppy lunch or snack if part of the routine/schedule. Exercise — We will make sure your puppy gets a bit of exercise during the day including walks, playing with toys, and fetch. Beginning Leash Walking — All walks include work on loose leash walking techniques. Commands & Manners — We will practice commands such as “sit”, “down”, “stay”, and “wait” with your puppy. We will even help to teach basic etiquette such as “no bite” or “no jumping”. We are available for walks Monday through Sunday from 9am to 8pm, 365 days per year. Infrequent / Inconsistent Puppy Visit Schedules. Instantly communicate directly with your dog walker about your dog’s every need. Receive a GPS time stamped map, pet care journal update, and photos of your dog after every visit. Our company is insured and bonded so you can rest easy knowing that everything is OK.
Let us help raise your pup into adulthood. Structure, routine, housebreaking, companionship, leash training, commands and more! Perfect for the puppy who has all their shots and needs to get out in the middle of the day with some exercise, a bathroom break, and some socialization. *Prices subject to change and fluctuate based on weekly frequency. Additional fees may apply.